News at Spencer Public Library: Speakeasy Adult SRP Party! Thanks everyone for participating in the Adult Summer Reading Program 2013. Sadly, at the end of July we will be saying goodbye to the Adult Summer Reading Program. But, before we say farewell, those who finished the program (read three books) will have a roaring time at our Speakeasy Party. Come dressed as a gangster, flapper, or just the way you are for door prizes, mock tails, and a twenties movie. 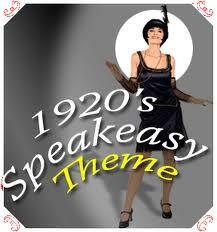 Please RSVP by telephone (580-7290) or at the front desk for the Speakeasy Party on Tuesday, July 30 @ 6:30 PM. If you read three books, you qualify for the party. We will draw for the Kindle Fire at the party, but you don’t have to be present to win. We will have door prizes to be drawn from those that attend.